The Junior Achievement Young Enterprise Malta Foundation (JAYE Malta) this week marked 30 years of inspiring young minds, with a seminar and celebration dinner. Junior Achievement Young Enterprise Malta Foundation (formerly known as Young Enterprise) celebrated its 30th anniversary with two events – a seminar entitled Valuing Entrepreneurship Education in the 21st Century, and a dinner; with both events held at the InterContinental Malta on December 5 and 6 respectively. The seminar’s objective was to discuss the impact of valuing entrepreneurship education to employability and wealth generation. It addressed the value that entrepreneurship education has towards the creation of a more adaptable, flexible and responsive workforce. The event also focused on what is being done locally and abroad to validate entrepreneurship education initiatives that add value to the economy. The seminar was addressed by Minister for the Economy, Investment and Small Businesses Christian Cardona, Minister for Education and Employment Evarist Bartolo, and Caroline Jenner, CEO of JA Europe. 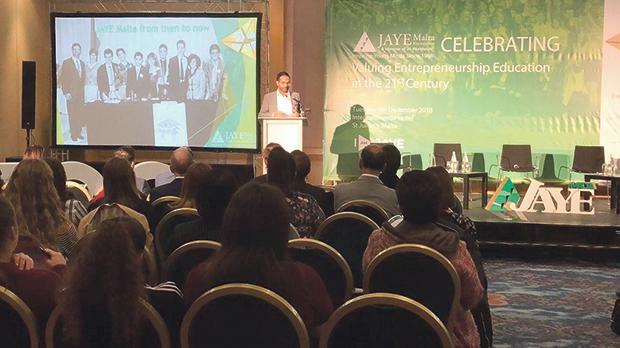 Looking back on the 30th anniversary events programme, Julian Azzopardi, CEO of JAYE Malta, said: “It was a week of stimulating discussions on the value of entrepreneurship education and what JAYE Malta has contributed to Maltese and Gozitan youth over these past 30 years. We are encouraged by the words of support shared by the President of Malta during our anniversary dinner, by the Ministers Bartolo and Cardona during our seminar, and all the attendees of the events. For more information visit www.jayemalta.org or follow @JayeMalta on Facebook.